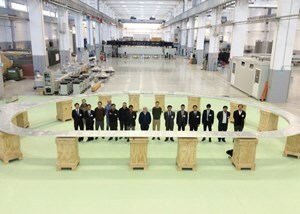 Representatives of the European and Japanese Domestic Agencies, Japanese manufacturers Toshiba and Mitsubishi, and the ASG consortium (ASG, Iberdrola and Elytt) pose inside of the completed, and successfully tested, prototype. Europe has successfully completed tests on the first full-size, superconducting prototype of a toroidal field coil "double pancake." 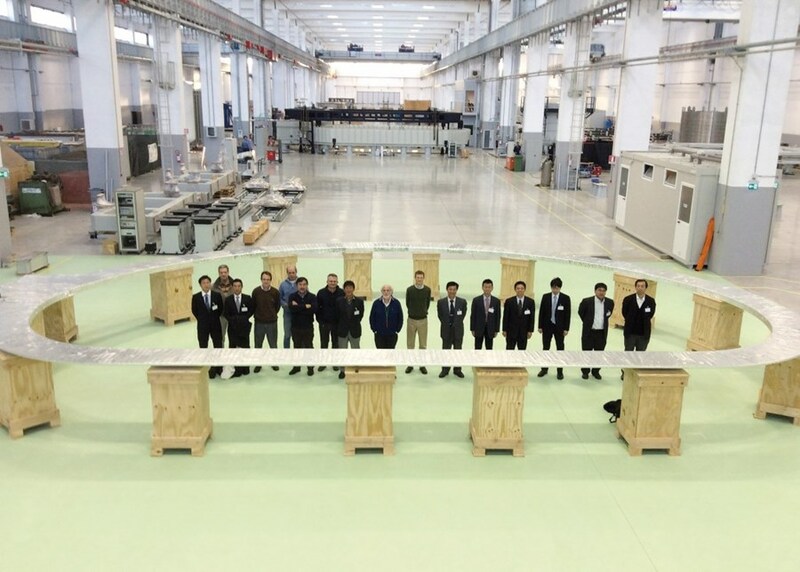 Each one of ITER's giant, D-shaped toroidal field coils will contain seven double pancakes. These pancakes, or layers, are composed of a length of superconductor, which carries the electrical current, and a stainless steel D-shaped plate called a radial plate, which holds and mechanically supports the conductor through groves machined on both sides along a spiral trajectory. In order to verify the prototype's ability to withstand the cryogenic temperatures of ITER, it was cooled to the temperature of liquid nitrogen (approximately -196 ˚C) and then returned to room temperature. The prototype was also thoroughly tested for its response to high voltage and was submitted to leak testing. All tests were passed without problem. For Alessandro Bonito-Oliva, European Domestic Agency project manager for magnets, "it is an important technological step towards the manufacturing of one of the biggest and most complex superconducting coils ever produced." He credits successful collaboration with the manufacturing consortium (ASG Superconductors, Italy; Iberdrola Ingeneria, Spain; and Elytt Energy, Spain) and radial plate manufacturers CNIM (France) and SIMIC (Italy), as well as collaboration with the ITER Organization central team and the Japanese Domestic Agency. Series production is progressing well in Europe for the toroidal field coils. Twelve radial plates have left the manufacturing lines at CNIM and SIMIC and 25 double pancakes have been wound at the ASG facility in La Spezia, Italy. Fifteen of the wound double pancakes have been through the process of heat treatment and 11 have been transferred inside of a radial plate. Read the original story on the European Domestic Agency website.